CHILD labor cannot be ignored as a vital factor in the present economic crisis. Children are leaving school and going to work at a time when millions of adults are jobless and many of these children are acting as the sole support of their families because their fathers and older brothers and sisters are unemployed. While it is true that the number of gainfully employed children has fallen off in the past two years, this decrease measured against the decrease in all wage-earning shows that child labor has only kept pace with the drop in adult employment during the depression. The reduction in the absolute number of child workers has been the most obvious and the most frequently discussed effect of the depression on child labor. A more significant though less conspicuous effect has been the change in the types of employment and in general working conditions. There has been an unquestionable shift of child workers to the less desirable, less well paid, and less well regulated types of employment. Thus domestic service, a type of work unregulated as to hours or general conditions of work, is taking a relatively larger number of 14- and 15-year-old girls now than in previous years. Selling magazines, candy or pencils, with bootblacking boxes and other street trading “occupations” as an excuse, children are struggling in ever increasing numbers to secure a few pennies from the casual passerby. Industrial home-work has taken on a new lease of life during the hard times and the employment of children in this most difficult-to-regulate type of employment has become an increasingly serious problem. In Pennsylvania, where machinery has been established in the Bureau of Women and Children for the enforcement of the state’s home-work standards, the proportion of illegally employed children during the past year was more than double that of the preceding year. Not long ago a pale little ten-year-old was found who regularly before and after school pulled bastings from the clothing the older members of the family had “finished,” thereby adding perhaps 50 cents to the weekly home-work pay. The shift in child labor to these less desirable types of employment does not by any means imply that children are no longer found in factories and stores. During the last school year more than twenty-two thousand employment certificates were issued to fourteen- and fifteen-year-old children in Pennsylvania. About three thousand were for after school or vacation employment, the others represented the shift from school to full-time employment for these children. We do not know how many of these youngsters were employed in industry, but we do know that far too many of the available factory jobs are being filled by children rather than by adults. In half the 153 plants in, eluded in a recent survey made by the Bureau of Women and Children, we found that eight hundred minors under sixteen years of age constituted a considerable part of the work force. In one county where the manufacture of cheap cotton clothing tends to concentrate, practically one fifth of the employee in the plants visited were under sixteen years of age. These same establishments also employed a large number of sixteen- and seventeen-year-old girls; in several, more than one half of the employees were under eighteen years of age. The last Census shows that the number of sixteen- and seventeen-year-old minors employed in Pennsylvania’s clothing industry had increased 67 percent in ten years. The weekly earnings of the fourteen- and fifteen-year-olds in the clothing industry in October, 1932 averaged a little over $3. More than three fourths received less than $5; 44 percent received less than $3; and 22 percent less than $2. Only five of the children received as much as $10 for a week’s work. Considering the meager earnings of these young workers, the most ardent advocate of the need for children’s help in maintaining the home today could scarcely justify the waste in human values involved in substituting gainful employment for school attendance. Information on actual hours of work was not available since nearly all the work is on a piece-rate and no time records are kept. In most instances the children were scheduled to work approximately the maximum number of hours permitted by Pennsylvania’s child labor law. Other indications point to the fact that far too many of the available jobs today are being filled by children who should be in school. Recently a continuation school was established in a Pennsylvania district where never before had there been enough employed children to require such a school. In Philadelphia in September, October and November 1932 over sixteen hundred general employment certificates were issued for fourteen- and fifteen-year-old children, more than eleven hundred of them for children taking their first jobs. In the same three months’ period more than twenty-seven hundred age cards were issued to sixteen- and seventeen-year-olds who were presumably cutting short their schooling and swelling the already overcrowded labor market. During this three months’ period 891 certificates for fourteen- and fifteen-year-olds were refused, about one fourth because the employment was not legal, the child was under age or below the sixth grade in school, three fourths because the child could not pass the medical examination. The question we confront is: Shall we continue to allow our children to pay for the breakdown of our economic system or shall we unite in a firm endeavor to give them their opportunity today to prepare for their share of the world’s work tomorrow? 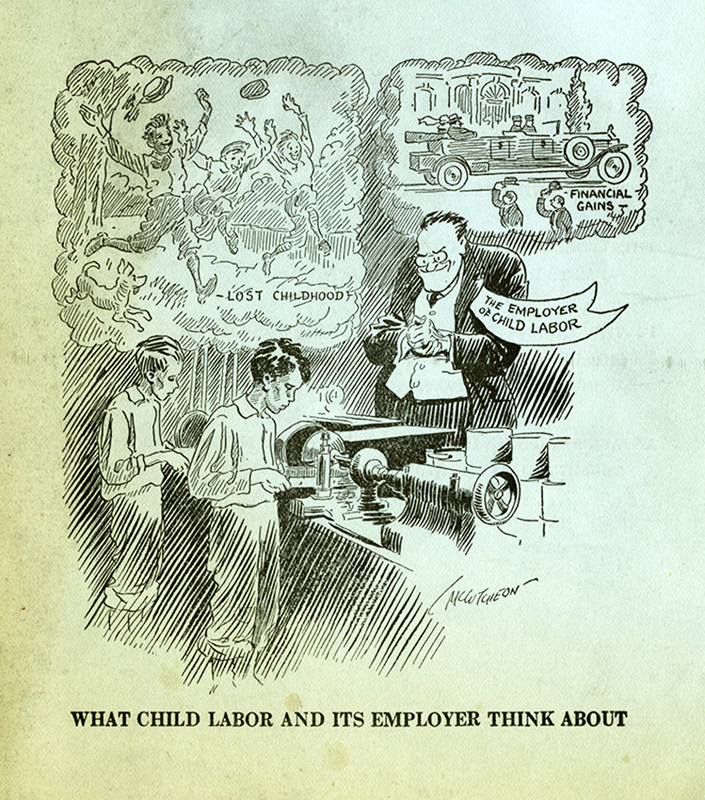 A child’s loss of schooling, of recreation, of adequate food and shelter now cannot be made up ” after the depression.” Industry no longer needs and should no longer be permitted to demand the services of children of fourteen and fifteen. No child who has left school and gone to work at these ages is free to develop mentally or physically according to modern standards. Child labor laws should be so strengthened that the health and safety of the next older group, the sixteen- and seventeen-year-old workers, are more effectively safeguarded. Working hours should be shortened; night work eliminated; medical examination and employment certificates required; and employment in hazardous occupations prohibited. According to the last Census, more than half our boys and girls of sixteen and seventeen in Pennsylvania had left school. It is folly to assume that any considerable proportion have found employment. If idleness is disintegrating for an adult it is infinitely more so for an adolescent. These boys and girls should be either in school or at work. Any movement to keep children in school places added responsibility on the schools. To work out school programs combining the cultural with the practical to meet the needs of all children is no simple task. The difficulty is increased by the present cuts in school budgets, and yet only by raising the age at which children may become wage-earners, setting up better safeguards for young workers and enriching the school experience of adolescents can we protect our youth from heavier depression burdens than they can safely bear. How to Cite this Article (APA Format): McConnell, B. (1933, May). The shift in child labor. The Survey, 69(5), 187. Retrieved [date accessed] from /?p=11098. Source: New Deal Network, http://newdeal.feri.org/texts/497.htm. (March 7, 2014).